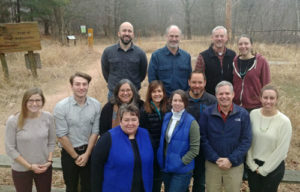 Thirty communities, nonprofit groups and counties will share $465,661.99 in 2018 state grants from the Department of Natural Resources Urban Forestry Grant program to promote and sustain urban forest resources in Wisconsin. 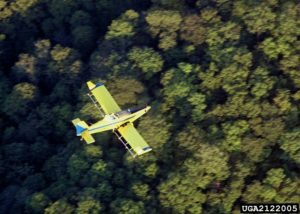 The WI DNR is proposing to deactivate the gypsy moth suppression program as requests for treatment have fallen to very low levels and this small need can be met by private businesses. The DNR is taking input on the proposed change to rule NR 47.910. If you have questions, concerns, or comments about this proposal you may give your input by attending a hearing or in writing. Input must be received on or before Tuesday, Dec. 19, 2017 to be considered. Public hearings will be held on Dec. 19, at 11:00 a.m. at DNR service centers in Fitchburg, Milwaukee, Green Bay and Eau Claire. Input may be given verbally or in writing at the hearing. Written comments may be submitted by U.S. mail, e-mail, or through the internet. Written comments will have the same weight and effect as oral statements presented at the public hearing. Preregistration is required. The cost to attend a training session is $30. For more information, visit UW Extension’s website. Fig 1. Average gypsy moth trap counts in northern Wisconsin counties. Map adapted from the Slow The Spread Foundation, Inc. Annual surveys conducted by the Wisconsin Department of Agriculture, Trade, and Consumer Protection (DATCP) indicate gypsy moth populations have increased in several northern Wisconsin counties and by 20% statewide. 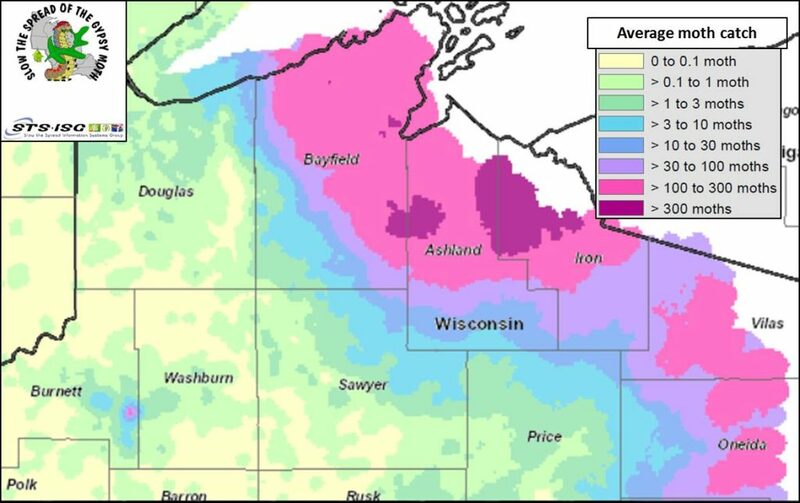 High moth counts were detected in pheromone traps in Ashland, Bayfield, Burnett (Dewey Township), Iron, Oneida, and Vilas counties, with the highest overall count in Bayfield County (14,354 moths total). Areas with an average catch per trap of 100 moths or more will likely experience damaging levels of defoliation by gypsy moth caterpillars in the following year or years (Fig. 1). Defoliation can be reliably predicted at the stand level by counting gypsy moth egg masses from August through March before egg hatch; these estimates help determine if preventive measures, such as physical controls, insecticide treatments, or delaying thinning activities are needed until populations collapse. In recreational and residential high-use areas, physical controls such as sticky bands and burlap barriers may be used to help reduce nuisance and aesthetic impacts from gypsy moths. Aerial treatments are used when gypsy moth populations are high. In managed forests, use of silvicultural techniques may be economically feasible to reduce productivity problems caused by the pest. Learn more about prevention and management options for your property by consulting with your local DNR forester or regional forest health specialist. More information about population sampling and management options is available online at www.gypsymoth.wi.gov. 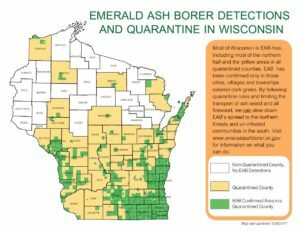 Emerald ash borer (EAB) continues to be found in new areas in the state. Wisconsin tracks EAB at the municipality or township level. Quarantined counties are shown in tan; infested areas are shown in green on the map. EAB quarantine map. Counties shaded in tan are quarantined for EAB, green areas are townships and municipalities where EAB has been confirmed. Map courtesy of WI DATCP. The Division of Forestry’s forest health team recently updated another forest health fact sheet about conifer bark beetles. Like the oak wilt and hickory dieback and mortality fact sheets revised earlier this year, the conifer bark beetle publication offers information about biology, impact, prevention and management of the insects. 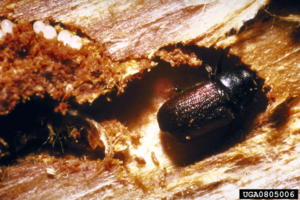 The conifer bark beetle fact sheet is available on the DNR’s forest health webpage. Is it SNEED or wet soils and nutrient deficiency? 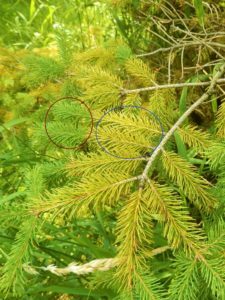 New needles are green (circled in red), and older needles are yellow (circled in blue) on this spruce. Spruce needles that are yellow with no visible fruiting bodies on the needles may be suffering from nutrient deficiency due to constant wet soils this year, or they may have a fungal disease called SNEED (spruce needle drop). Photo by Linda Williams, WI DNR. In late summer and early fall I had a few calls about younger spruce with yellow needles. These trees were typically 8-20 years old and were a very yellow color, with new foliage emerging a green color but quickly fading to yellow. There are two things that came to mind this year. The first thought is that we’ve had a very wet year. All year long roots were often in saturated or very moist soil. Consequently. the yellowing could be a sign of nutrient deficiency, specifically nitrogen, due to the saturated soils. The second possibility is a disease called SNEED (an abbreviation for ‘spruce needle drop’), which I typically see on heavier soils. SNEED in spruce is thought to be caused by the fungus Setomalonomma holmii. Pathogenicity of the fungus has not been proven, but it is the primary fungus present on trees with a particular suite of symptoms. Spruce with SNEED have current year needles that are a nice green color, but older needles will be yellow or yellow/green in color. Black fruiting bodies will look like pepper sprinkled generously on the twigs of the affected branches. Old needles, although not showing any fruiting bodies, will drop from the tree prematurely, and repeated years of this will cause the tree to thin, decline, and can lead to mortality. I’ve seen this primarily in plantations of white spruce on heavy soils, but have also seen it in blue spruce plantations; it’s reported in Norway spruce as well. I don’t know of any sure-fire chemical options to prevent infection or to help the trees recover. Management typically involves removing the most affected trees in the plantation, minimizing stress, and minimizing standing water or waterlogged soils where possible. Written by: Linda Williams, forest health specialist, Woodruff. Linda.Williams@wisconsin.gov; 715-356-5211, x232.